Case study – Woodworm infestation in a property in Pontcanna Cardiff. A middle of terrace property in Mortimer Rd Pontcanna Cardiff. During renovation work by a property developer, Storm were called to inspect the timbers for possible woodworm infestation. The existing timber floors throughout the property were suffering from a severe outbreak of the common furniture beetle (anobium punctatum). Many of the timbers had lost their weight and strenghth. Storm recommended the timber floor decking in areas were completely removed from the property and renewed with new treated timber. Over the properties history some of the bearing end joist ends had decayed which were leading to a structural risk. Storm recommended the joist ends were removed and renewed to a specification. 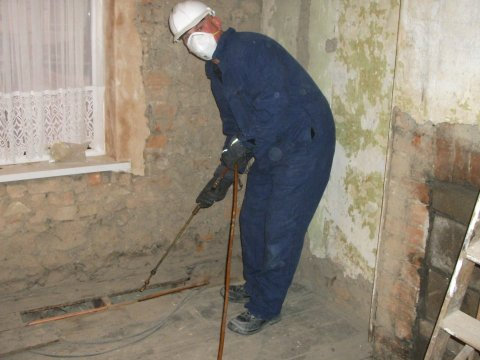 The picture above is of Storms operative Steve Bailey pressure treating the existing timbers to eradicate the infestations. Please note all the products used by Storm to eradicate infestations carry a full HSE product code of practise. There is no medical risk to people or animals.